Lobsters are large crustaceans that live in the sea. They form the family of Nephropidae, which is sometimes also called Homaridae. Lobsters are an economically important type of seafood. Several different groups of crustaceans are known as lobsters. When people talk about lobsters, most of the time they mean clawed lobsters, for example the genus Homarus. Clawed lobsters are not closely related to squat lobsters, spiny lobsters or slipper lobsters, which have no claws (chelae). The closest relatives of clawed lobsters are the reef lobster Enoplometopus and the three groups of freshwater crayfish. Smaller kinds of lobsters are sometimes called "lobsterettes". Lobsters are invertebrates. They have a hard exoskeleton (outer skeleton), which protects them. Similar to most arthropods, lobsters must shed (or lose) this skeleton before they can grow. This process of shedding is called moulting. When lobsters "moult", they are weak and easy to attack. Some lobster species' colors change when they are moulting. Lobsters live between the shore and the edge of the continental shelf. They live on rocky, sandy, or muddy bottoms (of the water).They usually live alone in cracks or under rocks. Lobsters usually eat live food, which includes fish, mollusks, other crustaceans, worms, and some plant life. Lobsters scavenge (eat dead plants and animals) when they need to. Lobsters also eat other lobsters (cannabalism) when they are not free; lobsters do not eat other lobsters in the oceans. People have found lobster skin in the stomachs of some lobsters. This is because lobsters eat the skin they shed when they moult. . Lobsters grow all their lives. Some lobsters live for over 100 years , and some become very very big. The Guinness World Records says that the largest lobster was from Nova Scotia, Canada and weighed 20.14 kg (44.4 lb). Similar to most arthropods, lobsters are "bilaterally symmetrical" - they are the same on the left and right sides. But lobsters who have claws often have claws of different sizes, for example the king crab. These unequal claws are for special actions. When a fisherman catches a lobster, the lobster's claw is often full and fleshy, not small. Lobsters have a cephalothorax which is the place where their head connects to the thorax. The carapace covers the cephalothorax and the thorax. The carapace is made of chitin. A lobster's head has two pairs of antennae and three pairs of jaws. Lobsters use their antennae to feel where they are. They cannot see very well. The abdomen of the lobster includes legs and a tail fan. Lobsters usually move slowly by walking on the bottom of the sea floor. However, when they are in danger and need to escape, they swim backwards quickly by curling and uncurling their abdomen. Lobsters can move at a speed of 5 metres per second. Lobsters live up to an estimated 45 to 50 years in the wild, although determining age is difficult. Lobster recipes include lobster Newberg and lobster Thermidor. Lobster is used in soup, bisque, lobster rolls, and cappon magro. 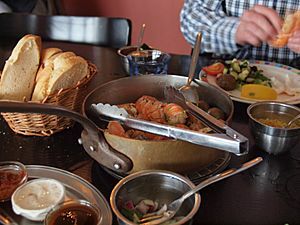 Lobster meat may be dipped in clarified butter, resulting in a heightened flavour. Cooks boil or steam live lobsters. When a lobster is cooked, its shell's colour changes from blue to orange because the heat from cooking breaks down a protein called crustacyanin, which suppresses the orange hue of the chemical astaxanthin, which is also found in the shell. In North America, the American lobster did not achieve popularity until the mid-19th century, when New Yorkers and Bostonians developed a taste for it, and commercial lobster fisheries only flourished after the development of the lobster smack, a custom-made boat with open holding wells on the deck to keep the lobsters alive during transport. Prior to this time, lobster was considered a mark of poverty or as a food for indentured servants or lower members of society in Maine, Massachusetts, and the Canadian Maritimes. It has been suggested servants specified in employment agreements that they would not eat lobster more than twice per week, however there is no evidence for this. Lobster was also commonly served in prisons, much to the displeasure of inmates. 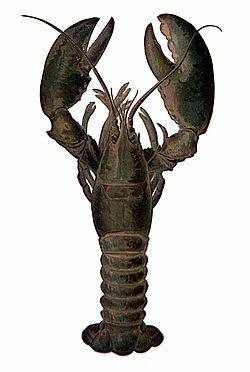 American lobster was initially deemed worthy only of being used as fertilizer or fish bait, and until well into the 20th century, it was not viewed as more than a low-priced canned staple food. Caught lobsters are graded as new-shell, hard-shell, or old-shell, and because lobsters which have recently shed their shells are the most delicate, an inverse relationship exists between the price of American lobster and its flavour. New-shell lobsters have paper-thin shells and a worse meat-to-shell ratio, but the meat is very sweet. However, the lobsters are so delicate, even transport to Boston almost kills them, making the market for new-shell lobsters strictly local to the fishing towns where they are offloaded. Hard-shell lobsters with firm shells, but with less sweet meat, can survive shipping to Boston, New York, and even Los Angeles, so they command a higher price than new-shell lobsters. Meanwhile, old-shell lobsters, which have not shed since the previous season and have a coarser flavour, can be air-shipped anywhere in the world and arrive alive, making them the most expensive. 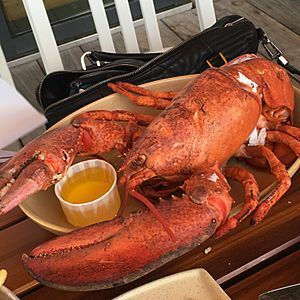 One seafood guide notes that an $8 lobster dinner at a restaurant overlooking fishing piers in Maine is consistently delicious, while "the eighty-dollar lobster in a three-star Paris restaurant is apt to be as much about presentation as flavor". Lobster Facts for Kids. Kiddle Encyclopedia.